performed by Wikipedia user La Pianista in 2011.
performed by Wikipedia user La Pianista in 2010. Eunmi Ko. Piano. Live performance at Museum of Romanticism (Madrid) on January 21, 2016. ^ Taruskin, Richard. 1996. Stravinsky and the Russian Traditions: A Biography of the Works Through Mavra. Vol. 1 and Vol. 2. Berkeley: University of California Press. ISBN 0-520-07099-2. ^ Broyles (2004), p. 72; Martens (1975), p. 29. ^ Kubik, Gerhard. "Bebop: a case in point. The African Matrix in Jazz Harmonic Practices." (Critical essay) Black Music Research Journal 22 Mar 2005. Digital. Lockspeiser, E. 1962. Debussy: his life and mind volume 1, 1862-1902. New York, Macmillan. Lockspeiser, E. 1965. 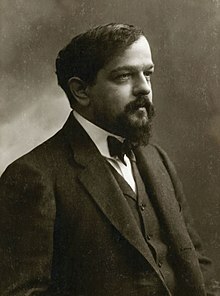 Debussy: his life and mind volume II, 1902-1918. New York: The Macmillan Company. Lockspeiser, E. 1972. Debussy. New York: McGraw-Hill.